The Echoes bird bath is a beautifully coloured, glazed ceramic bird bath that will make an attractive feature in any garden. 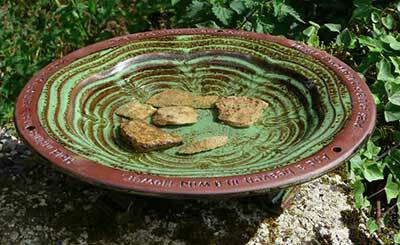 The Echoes bird bath is a beautifully coloured, glazed ceramic bird bath that will make an attractive feature in any garden and attract birds to come and bathe and drink. The bird bath is visually appealing and functional too as the attractive rippled graduated depth provides extra footing and grip for the birds. Durable and sturdy it is made from high-fired resistant ceramic and stands on 3 small ceramic feet.